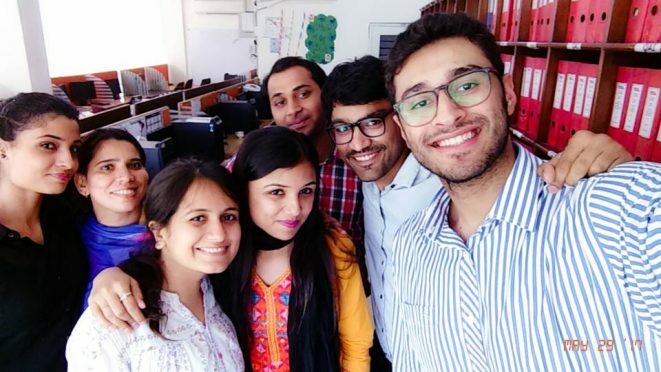 About the Author: Akshay Tandon (on the extreme right), a student of Amity Business School, Noida, shares insightful details about his struggle of getting an internship at Bry Air and how the experience helped him grow as a person. The first notice: I had been waiting for a business research/marketing profile during the summer internship placement period, but most of the companies which showed up were offering either sales or some other profile that I wasn’t interested in. One day, I got a notification on Amizone ( my college’s student portal) that a company by the name of Bry Air Asia Pvt Ltd was looking for students interested in business research. I got excited and filled up my details for applying to the company. After a few days, I got the notification that I was among the 20 students that had been shortlisted by the company based on our CVs. I was happy and started preparing for the telephonic interview by studying about the company, offered profile, etc. The day for the telephonic interview arrived, and I was constantly checking my phone, anxiously waiting for the call. When I didn’t get a call till afternoon, I reached out to my placement cell and they broke the news to me that the company had canceled the process after a few initial bad responses from students. Some students had applied for the internship without even reading the profile or job description and the initial 4 or 5 calls were made to these disinterested students, who did not even know the company products. My heart sank because I was really prepared for my call, so I asked my placement cell to try again. My professor asked me to coordinate with the remaining shortlisted students and confirm whether they were really interested in that internship. I sprang into action and immediately made a WhatsApp group. I got 6 confirmations and I gave that list to the professor. She called the company in front of me and gave them the new details along with mentioning how I had coordinated everything. Next day, the company made the calls, but again I didn’t receive a call. The interviewer got busy and postponed the calls for later. Meanwhile, Kirloskar Group also came to hire interns for business research profile for their upcoming project. I applied and reached the final round, but sadly couldn’t convert it. I was disappointed, but I didn’t lose hope. The second notice: After almost a month, the list of students shortlisted after the telephonic interviews by Bry-Air was out. I was shocked as I hadn’t even received the interview call. On inquiring, I came to know that the four students got selected out of the five students they called (unlucky me – I was the sixth one); however, there was a silver lining. Since two out of those four students had already been placed in Kirloskar, my name was forwarded as a replacement, and I was shortlisted for the personal interview. I was told to fill up my personal details in a form provided by them, while I waited anxiously for the whole process to start. The process started with a presentation about the company along with a video about Bry- Air. After the video ended, the HR started the interview. First round: We were asked to introduce ourselves. I talked about my qualities, hobbies, skill set, etc. but was overshadowed by the work experience of the other candidate as I was just a fresher. By this time the VP, corporate affairs, and the marketing head had also joined. We were asked for a formal introduction again. Then, we were given the debate topic, “Has demonetization affected the growth of the country”. I had to say against the motion. Communication skills were my forte and I came up with good points, which helped me recover some points lost in the introduction earlier. We both were asked to wait outside for the third round. The case study I was given was: “You are an independent consultant and a small shop owner has come to you with the case that through a period of 3 months (Jan, Feb, Mar) the revenue of his store has remained the same, but his profits have been declining as he moves forward. You as an independent consultant should analyze and suggest the necessary changes”. I jotted down my main points like operating cost, new labour, approaching summer, etc. and started asking questions which may suggest a dip in the revenue. I finally came up with the conclusion that since all the other factors had remained the same, except that his high-profit stock/goods generated less revenue as the months progressed from Jan to Mar compared to his low profits stock/goods, therefore his revenue remained the same and the profits declined. After a couple of days, results were announced and I was hired! My joy knew no bounds! I was given the project on my first day. I had to conduct my research on ‘Finding the Business Potential of Dehumidifiers in the Indian Meat Processing Industry.’ The icing on the top was that the projects given to the interns were decided by the MD of the company! An official meeting was called for the interns along with other senior employees. In that meeting, we were advised to make a structure of how we would be moving forward with our research and how we would reach a conclusion. 2) I turned into a vegetarian after my visit, because I saw the whole process of the slaughter of a full-grown water buffalo. Keeping the horror visions out of my mind, I came back and resumed my business analysis and started putting my report together. Soon, the day of our final presentation arrived. To our surprise, every senior employee of Bry- Air along with the MD was sitting there to watch our presentation. I was really anxious, but I gathered all my strength and decided to give it my best shot. I gave such an awesome presentation that I knew it from my heart that no matter what, I had won! When the results were announced, I was ecstatic as I was judged as the winner. I learned how to initiate a proper business research and the importance of credible resources. I understood that one hardly gets 5 minutes to make an impression in the corporate world. My mentor taught me how to make my presentations to the point and how to deliver only the relevant details creatively to capture the audience’s attention. And, most importantly, I realised the value of time management. I’ve learned that in the corporate world, every deadline is taken seriously and you have the ownership of your work. This is one advice that I’ve incorporated in my day-to-day life too, and I’m glad that my time-management skills have improved a lot. Motivated by Akshay’s grit and perseverance? Apply to these cool MBA internships and experience the corporate world yourself!